I decided today to break with an almost decade-long habit of not speaking personally. First, let me start off by apologizing. The week before last my computer program mistakenly published a draft of The Diversity of the Gospels, Part Two dealing with symbols of the Gospels as seen in the ensigns, or standards of the 12 tribes and also the attributes of God’s most prestigious Seraphim which surround His throne. It appears that it was posted for a few days so I would ask anyone who started to read that to read this article instead. It should make more sense. On a personal note, I have been asked to share some information about myself, which is understandable when it comes to dealing with some of the bizarre subject matter that I feel led to teach about. I have not spoken in a personal sense because I’ve always wanted to maintain the focus on what is being taught, which always centers on the person of Jesus Christ, His mission, His message, and most importantly His role as the kinsman redeemer, the Son of God incarnate, divinity persona; Who came to be the Lamb of God to die for the sins of the world. Let me start by admitting to all that I am a terrible teacher and writer, I have no gift in these areas, although I am a born-again believer of over 40 years I have wasted so many years mired in my own sin, as well as the preoccupations of religion; wherein any attempt at bragging regarding anything is needless. However, if in spite of myself your faith grows at all due to the things that I write, the glory goes to God for being able to use such a fallen creature as myself, it is to His glory alone! While I have been blessed with many insights that I’ve personally discovered in God’s Word, I too have repeated much that I have been taught and studied from great men who were educated by the Holy Spirit to handle God’s word in a literal manner (for a list of some of my resource teachers and their writing, please see my last endnote entitled “Sources – List of Teachers“). I attempt to use references when possible and have been called on the carpet by a good brother for not doing that more. I have never attempted to intentionally take credit for somebody else’s work. However, sometimes great insights have passed through so many hands that it becomes impossible to cite the originator of the thought. In these cases, I simply present that I believe the Holy Spirit, who is always the originator of insights into God’s Word is the creator, not myself. So, for now, let me simply ask you to please read what is presented as a Berean believer would, accepting thoughts at face value long enough to validate them in relation to what is presented in God’s Word. I spend a lot of time digging deep into the original Greek wording and grammar, which mandates the use of a Greek dictionary. I’m not talking about using a Strong’s concordance, which is a root dictionary and only meant for generic definitions. I’m speaking about digging into the grammar of the verbs and nouns in order to specifically research any text in its Biblical context in order to seek what the Holy Spirit desires to communicate. It is unfortunate that English is such a sloppy and inept language as compared to the Koiné Greek through which God chose to reveal Himself more intimately in the New Testament Scriptures. Koine Greek is an exact and detailed language, which when considered along with its grammar is like adding color and nuance to the black-and-white words of the text translated into English. What is amazing about the 4 Gospels is that they appear to be quite different from each other – on purpose. Many great scholars have attempted to create what is referred to as the synoptic (Meaning: “of or forming a general summary,” or in the case of the 3 Gospels, “a comparative chronological collaboration in the form of a summary“) Gospels in reference to the first three books of the New Testament; Matthew, Mark, and Luke. John is purposely excluded from the synoptic presentation of the Gospels due to the fact it is not meant to be chronological as far as time; John presents events by grouping them together based upon their importance and not the time sequence. Though this idea seems dishonest to the Western way of thinking, to the Hebrews this was often considered a more legitimate way of laying out events, based upon their importance and how they relate to each other rather than the limitation of a time sequence chronologically speaking. John’s Gospel covers 21 days of Jesus’ 3 ½ years of ministry. Virtually half of John’s Gospel is devoted to the “Final Week,” and is organized around seven miracles, seven discourses and seven “I AM” statements. Almost one-third of it (247 verses of 879) is devoted to one 24-hour period! What becomes unfortunate about attempting to plot the three Gospels on a single timeline is that they were never meant to be compared in this manner. All four of the Gospels were meant to be unique from their inception. God always meant that they were to be different one from another because they were meant to be different perspectives of Jesus Christ’s First Coming. These first four books of the New Testament give a rounded, more complete presentation of Jesus Christ from the vantage point of four different perspectives in order to present a fuller picture of who Jesus was. In particular, the Gospels showed what His role was in His first coming. One reason that God wants us to have a greater perspective of Jesus’ first coming is to counter the worlds’ attempt to mute the true message of the Gospel, to counter His power as God, sidestep His role as Saviour, and His authority as divine Judge by keeping our perception of Him as a tiny baby in a manger. The world is willing to accept the Christmas story of a baby Jesus who is powerless at Christmas time; yet sidestepping the biblical presentation that this was His role in His First Coming – He was meant to be the Lamb of God who would die for the sins of the world. Yet these same individuals are either clueless or completely unwilling to accept Jesus the second time He comes to earth, in a different role – the Goel (the Go’el HaDahm), and as His role of the Avenger of Israel (Numbers 35:12, Due. 19:6) who brings judgment upon the earth (See: http://www.biblestudytools.com/dictionary/goel/. or https://en.wikipedia.org/wiki/Goel), as a ruler on a horse who draws the blood of Israel’s enemies “slain with the sword of him that sat upon the horse, which sword proceeded out of his mouth” (Rev. 19:11-21). This is what the Jews were looking for in the first coming. However, God displayed His ingenious way of presenting Christ who has two roles, wherein the Jew would only see Him in the role that fit their own situation – a savior that rules and power and destroys enemies. This is why they refused to consider the suffering servant of Isaiah 52 and 53, as well as many other passages which display the Messiah as God’s representative who would die, as opposed to their own desire to be rescued in power. They refused to see that God needed to deal with their sin first by dying for them before He would come back and physically fight for them. How marvelous is our God that He could hide prophecy in plain sight, foretelling of two visitations without referring to them separately in order that Lucifer and his minions would be unaware that there were two visits, wherein they thought to kill Jesus, the Messiah before He came to power; never realizing the grace and mercy of God is seen in the fact that Jesus would die for our sins before He would come and claim that which He paid for thousands of years later at His Second Coming. This is why it is so important for us to understand that the Gospels were always meant to be diverse so that we could understand Jesus First Coming concerning His role as the Lamb of God that would die for the sins of the world. We Are Meant to Understand “THE GOOD NEWS” beyond Our Own Limited Perceptive – To See With Flesh Eyes That Which The Holy Spirit Alone can Enhance. God Wants, No Demands For us to Take Him Out of the Box we Try to Place Him into in Order to Appease Our Own Comfort. And Allow the Holy Spirit to Enrich Our Insight into His Holy Word, The Bible. We must humbly understand that our own limitations become the hindrance to us as finite men attempting to approach and comprehend an infinite God. We know we can’t do it on our own. We must be willing to allow the Holy Spirit to lead us and be willing to examine anything that is not solidified in God’s Word. Whenever a superior creature attempts to communicate with a creature that is severely limited, some tools are helpful. An example of this is called parenting; you find simple ways to communicate simple ideas to your baby. As it starts to become more sophisticated, so do your tools. One of the necessities of parenting is establishing consistency. Consistency validates reasoning. When consistency is not reinforced, it creates confusion and a lack of understanding, and reasoning is greatly inhibited. When parents are careful to establish patterns, children come to understand logic and reason. God communicates with us limited creatures in the same manner. One of the tools that He uses is “figures of speech” which help explain complex ideas in simple ways. While we may think in words, we reason in pictures. This is one of the functions of figures of speech. For example, if I say “get off my back,” I am not stating that you physically jumped on my back, but instead presenting a picture expressing a situation of agitation and burden put upon me by another person, you. We all use hundreds of figures of speech each day. Over 100 years ago, E.W. Bullinger documented at least 217 figures of speech used by the Greek and Romans that are also utilized in the Bible. We can look for these communication patterns in God’s word so we can understand on a deeper level what the Holy Spirit wants us to see. The Gospels are meant to be a multifaceted perspective of the Messiah of Israel – who would suffer and die for the iniquity of man as the deliverer of mankind, as the perfect man – sinless and without blemish as the only acceptable sacrifice to God; who was God incarnate; divine in His Majesty. These are the 4 perspectives as seen in the diversity of the 4 different Gospels. These 4 perspectives of Christ are mainly meant to display the role that He fulfills in His First Coming, while at the same time showing a small glimpse of who He is as the Eternal Son of God, Deity. These 4 roles must not be mixed up with the personage of the “Word” (John 1:1), of God (the Logos in the Greek, meaning: the revelation or communication of God), who became human and called Jesus, the Christ (“The Anointed One of God” – The Messiah of Israel; wherein the definite article, “The” is utilized to indicate there is only one. This term “Anointed,” when generically used in general referred to prophets and Kings whom God had anointed, yet when used with the definite article “The,” refers to one individual, it regards the deliverer of Israel – a specific personage above all others – The Deliverer of Israel, The Messiah), Who is not divided in who He is, He is singular in his personage, yet in His first coming is understood more completely as displayed and 4 aspects of the role that He fulfills as the Savior of the world. This mission was determined and planned by Him and the Father before the foundations of the earth (see Psalm 2, which refers to Jesus’ First Coming and Second Coming). These 4 facets as seen in the 4 Gospels, is not a new perspective; it has been understood from the time of the disciples of the apostles, wherein the purpose in these 4 books has been understood until our current day, though rarely taught. There are hundreds of plaques and reliefs found in Europe and Asia, which display the 4 symbols of the 4 Gospels: the Lion, the Ox, the Man, and the Eagle. Whenever you study the diversity of the four Gospels you see patterns and themes emerge. These patterns are so consistent that there, not a coincidence. As we examine the diversity of the Gospels, the patterns reveal four symbols — one for each gospel. These symbols have also been repetitively seen in God’s word in the Old Testament. When we see patterns repeated within the whole of God’s word in both Testaments, we should look for a connection between them and attempt to understand what the Holy Spirit would seek to show us. The four symbols that are described in the four Gospels represent the Messiah in His different roles. Through the Old Testament, the symbols were used to explain that God would send Jesus to die for the sins of the world in order to redeem all of mankind. We as children attempting to understand our Father can investigate these patterns to learn more about God and His will as seen in the person of Jesus Christ the Messiah. Jesus Christ was described in so many different ways with so many titles, prophecies, patterns and symbols so that even sinful man — under the leading of the Holy Spirit – should have been able to recognize Him when He entered the stage of time and will be able to when He again returns. In the Old Testament, cherubim are described as being stationed around the throne of God. Cherubim are also depicted on the lid of the Ark of the Covenant as a seat that the Messiah will sit upon. He will be covered by these unusual beings, these servants of God simply referred to as “messengers,” or angels in the English. What is interesting is that when you look at the representation of each one of these for different perspectives of Christ first coming – they exactly Mirror the four ensigns (A flag with a symbol representing the tribe) of the 4 tribes as they were located around the tabernacle, as well as the four faced Cherubim which serve God, as well as those which surround the throne of God in heaven. Please bear with me as I explain this bizarre statement. It means to dig into deeply, not simply superficially. This is one of those mandates that Christ gave us, because in the Greek grammar it is in the imperative; meaning that it is a command that we are to search God’s Word, and in so doing, uncover all that is in God’s Word which testifies of Jesus; this is where we are to gain faith, from God’s Word (“faith cometh by hearing, and hearing by the word of God.” ~ Romans 10:17). This means reading everything in God’s Word, not simply the New Testament and its direct teaching of doctrine, but also the Old Testament, with many of its mysteries, as well as presentations that seem boring – they ALL point to Jesus, and this is our assignment as students of the King – to dig through God’s Word and find those things that build faith in our lives – but where are all these occasions which point to Christ. First, we need to realize that the writer here is quoting Psalm 40:7 (Psalm 40: 7 has always been understood to be a Messianic Psalm referring to the Messiah. ), as well as stating its current application to Jesus, even as it related to the sacrificial system; thus indicating that this Scripture has fulfillment of the Old Testament in the New Testament, as the passage has meaning concerning both the Old and New Covenants (Hebrews 8:13), indicating that Jesus is preeminent in both the Old Testament and the New Testament. The writer of the book of Hebrews indicates how Jesus was the fulfillment of the Hebrew Messiah. In the English translation, this text seems somewhat straightforward, though many misunderstand the use of the word “volume” thinking it means the amount of space concerning what is written; yet this is not what it means, it has greater significance than even this misunderstanding. The word that is translated into the English word “volume” in the Greek is kephalis, which holds great special significance in understanding this passage. At the time it was written, the Hebrew Holy Scriptures were copied onto long manuscripts which we commonly refer to as scrolls, which were rolled up due to their massive length. Different than codices, which might be synonymous with our ideas of a book with individual pages that were held together by a binder were not yet prevalent. Codices and books were ingenious devices, in which you could turn to any section and read at will, commonly known as random access systems. Whereas scrolls are a chronological device, in which you start at one point and unroll to another point while reading. Because scrolls were so large and unmanageable, in order to handle the scroll without damaging it, and to aid in reading the scroll, the Hebrews used two kephalis, which were wooden rods that would be placed at the end of each side of the scroll, in order to facilitate the reading of the scroll by simply unrolling the kephalis on the left, and rolling up the kephalis on the right (Remember, Hebrew was read from the right to left). The kephalis was what held the Scripture together and made it functional – readable, and understandable in that you could go from section to section, cross-referencing passages, able to do great research, and maintain Biblical context, not simply immediate context (Biblical context can be as important as immediate context, matching subject matter with subject matter many books in order to gain greater insight and clarity), while at the same time protecting the scroll itself. The point that this Scripture is making is that Jesus holds together God’s Word and presents it in such a way that it is readable, understandable, and protected – Jesus, in essence, is the foundation and the mortar that holds the pages of God’s word together concerning its subject matter – which is Jesus Himself. What does this mean, if it does not mean what it states, that the Basis of God’s word is written about the Messiah – Jesus Christ (The Greek word translated to the English Word “volume,” is kephalis and is a reference to the stick that held a manuscript together in order to roll it up – it would be synonymous with our concept of the binding of a book, that which holds all the pages together and would be considered the basis of the book in concept – It’s foundation – Jesus is the foundation of God’s word). So where is Jesus found as the basis of the Old Testament as stated in the book of Psalms, as well as repeated for the New Testament in the book of Hebrews – where do we see Christ as the foundation wherein everything is viewed concerning him? 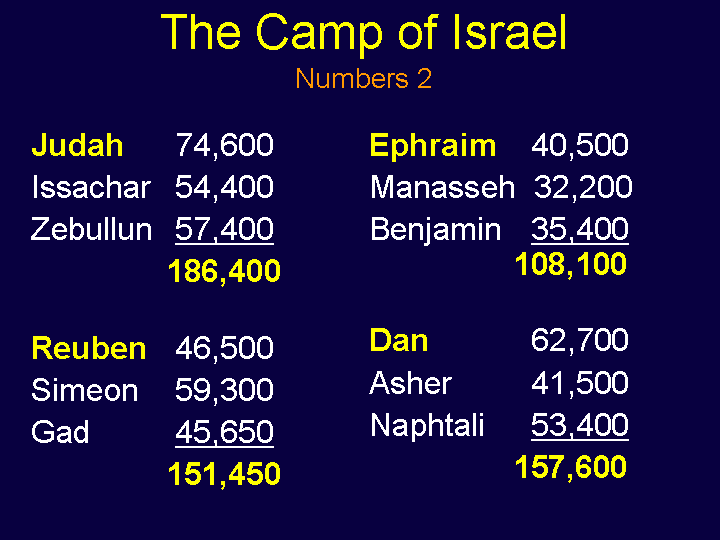 If you scroll down below you will see a layout of how the 12 tribes of Israel camped around the tabernacle as they went across the desert. The same symbols are viewed as the four faces of the four living creatures, the cherubim spoke about in Ezekiel 1:5-10. What an amazing coincidence that we see the Angels which reflect God’s glory symbolized the same as the Ensign surrounding the tabernacle. Yet, if you take a detailed examination of the tabernacle each article used to build it, as well as Their typological meaning display characteristics, all combined to symbolize only one thing in all of the creation – Jesus Christ. There are many books on the subject that I would suggest you consider. You see what we must understand is that everything in God’s Word is there for a reason: matter, substances, materials, things made, numbers, colors, animals, names, places, people, and lives; all have meaning which points to the person of Jesus Christ, and/or His missions upon the earth. Please search the following Scriptures (Based upon 1 Corinthians 10:1-6; Romans 15:4; Colossians 2:17; Hebrews 8:5; Hebrews 9:5; Hebrews 10:1; but for a few), which validate this principle of “Expositional Constancy,” wherein the Bible utilizes types and symbols, as well as over 214 other rhetorical devices, called: “Figures of Speech” (see LINK-FIGURES OF SPEECH ~ PART 1 & LINK-FIGURES OF SPEECH ~ PART 2). “Expositional Constancy” is where a common word is used outside of its normal range to indicate that it is referring to that which is not common, but to something else, it is a type, a model, an example to lead to greater meaning beyond the simple text – this does not mean that the text is not literal in its interpretation, all text is to be taken literally as God spoke it, yet included with this literal interpretation is deeper insights which add emphasis concerning that which was is spoken – such as silver is utilized concerning redemption, gold references divinity, bronze is utilized in judgment and sacrifice concerning judgment – this is a small example of metallurgy when it comes to how the Bible utilizes the subjects to extend meaning beyond the simple verbiage. The word redemption means: “to purchase a slave from the market,” yet in purchasing a slave mandated the use of silver coins, Judas was paid in silver coins in betraying the Lord, The Pharisees purchased a slave – Jesus the suffering servant would die for the sins of the world. Silver always signified redemption, in that the oldest male would offer up a temple silver shekel to redeem their soul, The Jew always understood the significance of silver regarding redeeming that which was lost – the same as Christ redeemed us with his blood. Yet, based upon the context of the specific use of the word “Shadow” in Hebrews 8:5, we understand that it was used to mean a representation of another object, which in this case would be of: “heavenly things.” The point the author was making is that this instrument on earth which was made according to specific plans given from God to Moses (Exodus 25:9), was meant as an example, or what we would commonly refer to as a “model” of something in heaven. He later makes the point concerning the next chapter wherein we are told that Jesus was the “greater and more perfect tabernacle,” that the heavenly thing that the earthly tabernacle represented was our Lord and Savior himself – but why? The answer is quite simple, one of the terms that was used for the “Tabernacle of the congregation,” (Exodus 33:7) which was translated to the “tent of meeting,” referring to the place that God and man would meet together, where the priest would come into the Holy of Holies, based upon God’s terms and commands and would stand before the creator and God of the universe – Jesus is the meeting of man with God, made possible by him shedding his blood as our mediator, are representative – Jesus is our meeting place with God. Without Jesus man has no ability to associate in any way shape or form with God. This is why The tabernacle was a representation of Jesus. And as a perfect God, details are also perfect. That term almost and God never goes together. For God to be God everything he says to the minute degree is true, and if he gives us an example, we are never to take it as superficially handling without further examining in greater detail what else he means by the use of that model or example. Hence every aspect of the tabernacle is a representation of Jesus. This is where the above verses come into play in that we see Jesus not only in the prophecies of the Old Testament concerning his first coming and second coming, but also in the symbols and representations, as well as the titles which describe him and fulfill those Scriptures regarding the preeminence of Jesus Christ in God’s Word. The outer court which surrounded the tabernacle was fenced by a 7 1/2 foot tall curtain that was held in place by brass bars. The curtain was white linen. As you would approach the tabernacle all you could see is the pure white linen without the ability to see what is inside. No man could approach the tabernacle but from the East side where the opening was always pitched. The framework concerning this outer courtyard was brazen metal, which was used to hold sacrifices because it Would not be consumed with fire – it was always emblematic of judgment, as a sacrifice was placed within it and judgment was always associated with this mental. As you would approach the outer court an inner in the first thing you would approach is the brazen altar of sacrifice – Remembering that the tabernacle was not a place for the common man to meet God due to his sin, it was a place for God’s representative; the priest to meet God based upon God’s requirements. As the priest would enter into the complex they would first approach the brazen altar and deal with sacrifice for sins. Next, they would approach the brazen laver which was filled with water, where the priest would wash off the blood from the previous sacrifice from their hands, yet they would also worst their feet (Exodus 30:18). The laver and was made out of brass from the looking glasses of the Egyptians (Exodus 38:8) which they donated to the Israelites as they left. It was a precious metal that was beaten until a reflection would be gleaned. As the priest would stoop over the labor and they would see a reflection of their own image in the judgment of the brass labor and would wash their hands which signified their behavior, and their feet which symbolized their walk through life, always aware of their own sinfulness as reflected, yet cleaned with the water (Exodus 40:7). Water is always signified as God’s Word (Ephesians 5:26), God’s provision for man, as seen out of the water which comes out of the rock that Moses smote – Jesus, who was the living word of God (Exodus 17:6; 1 Corinthians 10:4), The logos (“Communication” ~ John 1:1). The tabernacle itself had wooden planks that were set in sockets. The sockets of the tabernacle which held the wooden planks (shittim wood ~ Exodus 26:15) which were covered in gold (The same tree that Jesus was crucified upon), the same word that made up the lower part of the Ark which was a sarcophagus without a lid (Representing how the grave could not hold Jesus), yet It was not only Made of wood which would symbolize Christ’s humanity as a living thing, but that was covered in gold which represented His deity (Exodus 25:10-11) – everything in the tabernacle pointed to Jesus. As you entered the tabernacle itself, on the left was the golden lampstands, which was made out of one piece of solid gold in held oil which signified the Holy Spirit which provided light. On the right was the table of showbread which symbolized the manna as God’s Provision for Israel. What is interesting is not only what was in the tabernacle. but what was not? As stated the walls were made up of wooden planks covered in gold set in silver sockets, but there was no floor. The reason why is that man as he stood before God would not stand on the work of his own hands, or what he had created; he would stand on God’s earth alone. There was also no Windows within the tabernacle to provide light. The only light came from the golden lampstand symbolized as God’s Holy Spirit; wherein God alone provided light. Next, you would encounter the altar of incense which was representative of the prayers of God’s people which as smoke would lift into his presence so the prayers of his people would come before him. This outer room was referred to as the Holy. Next, you would approach the Holy of Holies, Which was behind the veil which was approximately 12 inches thick wherein the Holy of Holies was on the other side. Within the Holy of Holies stood the Ark of the covenant, which referred to above was made of wood covered in gold. Sitting upon it was a separate article referred to as the mercy seat. It is always referred to as an individual article and not part of the Ark of the covenant, which is a reference to the combination of the two but yet held a separate. The bottom portion of the Ark as stated was us a Sarcophagus with no lid. Normally a Secaucus had a lead which was permanently attached, Yet this Secaucus had no top. What was temporarily placed upon the bottom part of the Ark was referred to as the mercy seat. The mercy seat was a chair, actually a throne where two Angels on each side were stationed as in heaven. It was made of pure gold symbolizing that only deity Could sit on the throne – only Jesus, the pre-incarnate deity we call God could sit on this throne. There was no other furniture, the priests could never sit down inside of the tabernacle. God alone held the authority to sit, while others stood in his presence. This has been carried on for thousands of years. Within the Secaucus laid a jar of manna, a representation of the law, and the rod of Aaron that budded; Symbolizing God’s requirement of the law, God’s provision of the manna, and God’s miraculous power in causing a dead Rod to blossom. On the inside of the tabernacle as you looked up you would see white linen with blue and purple embroidery of Angels representing God’s purity and his provision and overseen man as seen as the Angels did his bidding. There were other coverings on top of the white linen with the final being either badger skin, or porpoise skin; representing the lack of beauty as seen from the outside which hid the divinity which was on the inside; both of which represented the incarnation of Christ. The tabernacle is a temporary building where God met man’s representative the priest based upon God’s mandate of redemption solely at God’s discretion. No man was allowed to enter the Holy of Holies, the place of God’s dwelling. Once a year, a priest, who had met many obligations, and toured the Holy of Holies on the day of atonement. We know that this was a type, a figure of the high priest, Jesus Christ as stated in the book of Hebrews. Regarding Jesus and his incarnation, we read in John 1:14 that He “dwelt” among men. The Word dwelt is actually tabernacle, a tent-like structure; meant as a temporary dwelling only. As seen in the first picture and in this plaque is of the 4 figures of the 4 books of the Gospel (the Lion, the Ox, the Man, and the Eagle), with the Lamb of God in the middle – it was made less than 400 hundred years after Christ, displaying an early understanding of the diversity of the 4 different Gospels. The writings of Irenaeus (who was a disciple of Polycarp, who was a disciple of John the author of the gospel, the 3 letters, and the Revelation of Jesus Christ); referred to these 4 perspectives of these 4 Gospels, which were commonly accepted as canonical at his time. The Catholic Church has displayed these 4 symbols of the Gospels since the time of Irenaeus and is seen in the writings of Augustine, Jerome, and many others. If you enter many Orthodox Churches in American; such as Lutheran, Presbyterian, Anglican, Methodist, and many other churches that are hundreds of years old, going back to the reform movement of Martin Luther in 1517, when he publicly accused in separating himself from the Catholic Church, you will find references to these 4 perspectives as seen in the 4 Gospels. God’s Word is about God, not man. Yet, we are blessed in that man is addressed as God’s creation (Adam was made in God’s Image, not us – we fallen men are made in Adams image after his fall. However, we still carry some of the imageness of God but corrupted by sin. We pollute our imageness of God), originally formed in His Image, made to be His children, based upon a relationship established and maintained in faith. This is what Adam violated, yet Christ corrected (1st Corinthians 15:22 & 45). Therefore, we understand that the words of Jesus as recorded in John 5:39 our literal (Hebrews 3:1-6); that the complete “Word of God” speaks of Him, not only in direct terminology, but as noted in the book of Hebrews; God utilizes types and shadows (Hebrews 8:5; Hebrews 10:1), and in 1 Corinthians 10:11; 1 Corinthians 10:6; and in Romans 15:4 and Colossians 2:16-17, with many other types of object lessons throughout God’s Word. This is why there are over 300 different titles given to Christ in the Old Testament. All meant to paint a picture so we would recognize Him when He shows up on the stage of time. And this we see as well in the 4 Gospels. They present four different perspectives of Christ’s role in His 1st coming. Yet, we must also understand that these roles that He fulfilled are not to be confused with His personage. Because the next time that Jesus comes (Rev. 19:11-14), He will not come as the Lamb of God to die for man’s sin. He will come as the conquering King (with His saints Deu. 33:2; Zec. 14:5; Jude 1:14; Rev.19:10-14; Dan. 7:10), the Kinsmen-Redeemer of Israel (LINK-Part 1), who wages war upon the “earth dwellers” (“them that dwell upon the earth” see: Revelation 3:10; 6:10; 8:13; 11:10 2xs; 13:8, 12, 14 2xs; 14:6; 17:8) that came against the nation of Israel. The blood at His vengeance (Rev. 19:2) is so vast that it is said to be up to the bridle of a horse (Rev. 14:14,20). We must never mix up the personage of Jesus with the roles that He has, and will play within history. At His Second Coming, you will not observe the Christmas baby that has been neutered by the world with no power. This will be Christ in His glorification coming to take that for which He paid for at the cross. He comes with His saints (Deu. 33:2; Zec. 14:5; Jude 1:14; Rev.19:10-14; Dan. 7:10), the redeem mankind, to save Israel. 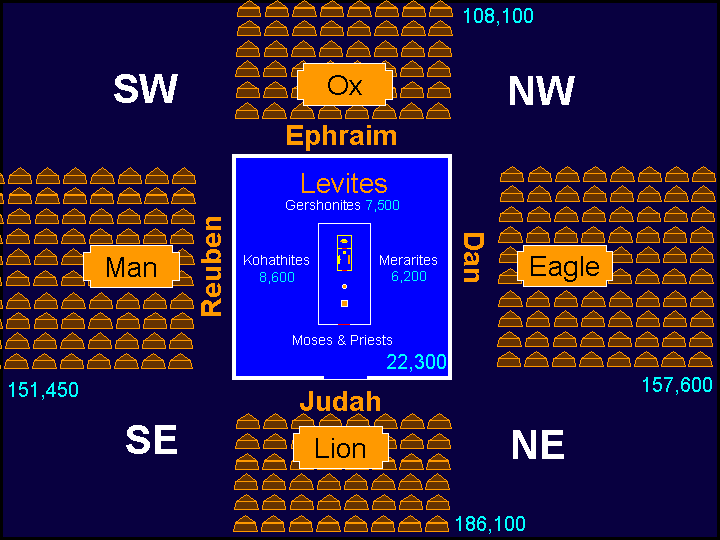 Levites, representing the priesthood centered around all four sides of the Tabernacle. Wherein the only way to approach the tabernacle was through priest; who at the time was the only way to God. This was a representation of God’s relationship with man prior to the atonement made possible by the death of Jesus Christ, who became our high priest; making null the earthly priesthood system. We would like to thank Chuck Missler for his teaching in this matter, and the production of the above slides, though Chuck did not create this teaching, as it has been around for quite some time. How amazing that the tabernacle, a symbol of Jesus Christ, the Redeemer of Israel, would be surrounded by the priest on all 4 sides, in that man could not come to God on his own basis, but needed a mediator. And that all 12 tribes surrounded the tabernacle as they walked across the desert wherein from above a pectoral of a cross would be seen. One would ask since there were no flying machines at that time, what good did this produce. God does not do things solely that man would understand, though we do know that when Balaam was overlooking the 12 tribes wherein he was being coaxed to curse them by King Balak, this is the view he would’ve seen from the cliffs (Numbers 23:9). One thing that must be understood is that the 3 tribes on each, based upon God’s direction would meet behind their ensign – their standard, and would line up at a certain with across, so as not to crowd into those tribes on their left of those tribes on their right. Then at the tail of the first tribe, the 2nd tribe’s ensign – standard would be where that tribe set up, and the same for the 3rd ensign – standard. 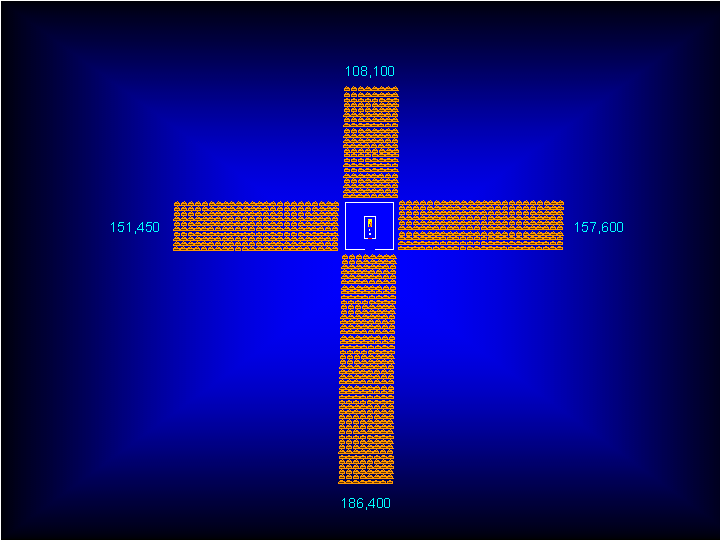 This is why it would look like a giant cross rather than a giant square. Rather you take this at face value or not it is based upon God’s description to Moses as seen in the Torah, the Talmud, and other Jewish writings. What is also amazing is that in heaven, in God’s throne room, we have Him seated in the middle with the 4 angelic figures with the face of a lion, an ox, a man, and an eagle; wherein according to the book of Hebrews, the tabernacle was a type of the throne room of God, with God in the middle, the same as the tabernacle. c. Holman Bible Dictionary, Holman Bible Publishers, Nashville,Tennessee, 1991, Page 900, 920.
e. The term in Luke 3:23 is nomizo in Greek: meaning: “reckoned as by law.” Joseph was adopted by Heli, Mary’s father in accordance with the Torah for inheritance through brother-less sisters given to Zelophehad (Numbers 27:1-11; Joshua 17:3-6; Ezra 2:61; cf. Nehemiah 7:63; Numbers 32:41; I Chronicles 2:21-23, 34-35). The Following is presented a brief presentation of Part 1 of this series meant as a refresher. Have you ever wondered why the Bible contains four accounts of the life of Christ? Each of the four Gospels presents Jesus Christ from a different point of view, with variations which sometimes seem to contradict each other. Atheist and unbelievers attempt to make the point that the Bible is man-made by pointing out these apparent discrepancies. However, the Gospels don’t really contradict each other; they merely present distinct emphasis, or different aspects, or even diverse perspectives of the personage and Mission of Jesus Christ. Matthew presented “the Messiah the King, “symbolized by the lion of the tribe of Judah (the King of Israel, the Lord God of mankind). Matthew, being a Levite, emphasizes Jesus as the Messiah, the Lion of the Tribe of Judah. Each of the subtleties of his design supports this primary theme. His genealogy begins with the “first Jew,” Abraham, and continues through David and the royal line to the legal father of Jesus, Joseph (according to Hebrews Law, in the same way, that a stepfather was a legal guardian and father). Matthew’s emphasis is on the fulfillment of the prophecies of the Tanakh, the Old Testament. As a customs official, Matthew was skilled in shorthand, an essential asset in a culture that did not have the advantages of printing, copiers, and the like. Matthew focuses on what Jesus said and includes the extensive discourses, which he probably was able to take down verbatim. Matthew’s first miracle is the cleansing of a leper, a Jewish metaphor for sin itself. Matthew concludes with the resurrection, also a distinctive Jewish preoccupation. Mark presented the “Suffering Servant,” symbolized by the ox (oxen were examples of extreme servitude, which exemplifies Jesus complete humility and servitude of the father as well as Him serving man by dying for him, though He was King. Thus fulfilling Isaiah 52 & 53 as the servant of God, who laid down His life, and became poor that we would become rich). Each one of these for symbols (lion, ox [sometimes mistranslated “calf” ~ Revelation 4:7], man, and eagle) were the ensigns that the twelve tribes of Israel stationed themselves around the temple during the time of the Exodus. This same symbolization is seen concerning the “Living Creatures,” the Cherubim, and the Seraphim (Isaiah 6 [some believe that the Seraphim are the same thing as the cherubim]; Ezekiel 1; Revelation 4:7), of God which oversee God’s throne room. Each one of these symbols represents the mission and personage of Jesus Christ (we must remember that the central point of the Bible is the person and mission of Jesus Christ; the central theme of the Bible is not Man or his salvation, but the glory of God [Isaiah 43:7]), His preeminence in creation (see John 5:39, Hebrews 10:7 [Psalms 40:7]; Colossians 1:16; Matthew 5:18; Luke 24:27; Luke 24:44-47; John 1:45; John 12:16; John 15:25; Acts 1:16; Acts 8:35 [Isaiah 53:7]; Acts 10:43; John 1:1; John 1:14; John 1:29; John 5:46-47; John 14:6; John 17:7; Acts 2:16-36; Acts 3:18; Acts 13:27-37; Acts 26:22-23; Acts 28:23; Romans 1:1-3; Hebrews 1:1-8; Hebrews 4:14; Hebrews 10:7, for but a few references), and has been hailed as pictorials of Jesus since His time until now, as is seen in many Orthodox churches (Methodist, Lutheran, Presbyterian, etc. ), though not as widely taught as previously before. Mark was the amanuensis (secretary) for Peter, and he emphasizes Jesus as the obedient Servant of YHWH. His is the only Gospel with no pedigree or genealogy; because slaves don’t have genealogies. Genealogies are meant to display pedigree concerning a royal line in order to continue the lineage of a King by establishing a record of his children and descendants. Slaves never had genealogies. Mark focuses on what Jesus did; it deals in graphic images, almost like a movie or video shooting script. Mark concludes with the final visual appearance, the Ascension. Luke presented the “Son of Man,” the perfect man (a sinless man, the same as Adam, man as he was meant to be). Luke was a Gentile and a doctor, and his Gospel reflects a very distinctive point of view, emphasizing Jesus as the Son of Man. His genealogy begins with Adam, the first man. From Abraham to David, his list is identical to that of Matthew. However, when he gets to David, he doesn’t track through Solomon (the first surviving son of Bathsheba) but through a different son, Nathan (the second surviving son of Bathsheba). He continues through to Heli, the father of Mary (Joseph is the son-in-law of Heli). The term used in Luke 3:23 concerning Jesus is: “being (“as was supposed” in the Greek) the son of Joseph,” which is nomizo in the Greek, which is literally translated: “reckoned as by law.” this indicates a legal adoption of Jesus by Joseph which is part of the rule of inheritance concerning the Hebrews. In the Hebrew society, the intended heir of the household received the household inheritance by the legal act of adoption which separated him from his siblings. The heir received the whole estate with his siblings receiving only what he might decide to hand down to them. This is what is being referred to here; Joseph legally adopted Jesus as his heir; which validated Jesus legal claim in this bloodline. But what is glossed over is that this genealogy is not the genealogy of Joseph, but is the genealogy of Mary through her father, Heli to Jesus (Matthew is the genealogy of Joseph who had legally adopted Jesus concerning the royal bloodline of Judah through David), establishing Jesus’ genealogy back to Adam the first man, which is what this book emphasizes. Luke 3:38 states that Adam was the “son of God” (God established the pattern of using the expression, “son of…” in referring to anything that flows out of the original source, or that was created by the source, therefore the angels are referred to as “sons of God” [Job 1:6; 2:1; 38:7] as God created them in the same way that Adam is referred to as a “son of God,” because God created him as well [Luke 3:38], and as Jesus had called the scribes and Pharisees “sons of the devil“ [John 8:44], because they flowed from their father Satan and their actions betrayed this. Yet, this is different from Sonship according to essence, which is what Jesus Christ is, a literal “Son of God,” not figurative.) and in this genealogy concerning the humanity of Christ it confirms Jesus as the second Adam (1 Corinthians 15:45), the true son of God in every sense in Luke 3:23, in the original language, the definite article (tou) is in the genitive form and appears before every name in the genealogy except one, that one name is Joseph. This singular exception strongly suggests that Joseph was included only because of his marriage to Mary. The Greek word for “son,” is uihos, [G5207] and was used primarily to signify the relationship of offspring to the parents in a literal sense, yet it was also used in a figurative sense concerning a full range of relationships or descriptions. Heli, Mary’s father, having no sons, only daughters, would normally have his lineage stopped at his death. However, in preparation for this very event, that of the birth of God’s Son, incarnate, the Logos (“the Word” ~ John 1:1) of God (Jesus) becoming a Man, in which the necessity to establish not only His bloodline of Kingship (Matthew’s genealogy) but also His bloodline concerning his humanity (Luke’s genealogy), God instituted a situation back during the Exodus that would validate Jesus concerning both issues, in the situation concerning the daughters of Zelophehad. Where Moses went to God, and God declared that the blessing of the bloodline could flow through the adoption of son-in-law’s in order to maintain the blessing of blood through genealogy when there were no sons to do so. Therefore, we understand that Joseph was adopted by Heli in accordance with this exception created in the Torah for inheritance (Numbers 27:1-11; Joshua 17:3-6; Ezra 2:61; cf. Nehemiah 7:63; Numbers 32:41; 1 Chronicles 2:21-23, 34-35). As a Gentile, Luke’s emphasis is different. His emphasis is Christ’s humanity; he focuses on what Jesus felt. His first miracle is the expulsion of a demon, a very human concern. Luke concludes with the promise of the giving of the Holy Spirit, which is a natural bridge to Luke’s subsequent volume, The Book of Acts. John presented the “Son of God,” God incarnate, God indwelling flesh, Divine; in symbolized by the Eagle (the Eternal Son of God, the Logos, God’s Communication of Himself through His Son). John had a very distinctive view, emphasizing Jesus as the Son of God. It focuses on who Jesus is. His “genealogy” is that of the Preexistent One, constituting John’s opening verses: “In the beginning was the Word, and the Word was with God, and the Word was God.” This is a genealogy of the Divine Son of God, who has no beginning and no ending, who was never created yet created all things. John’s Gospel is organized around seven miracles, seven discourses, and seven “I AM” statements. John’s first miracle involves the use of the water of purification being changed to wine at Cana (a pictorial of the church), a private demonstration to the disciples that Jesus was preeminent even over the Levitical priesthood. John concludes with the promise of Jesus’ return, and becomes the appropriate prequel to John’s final writing, The Revelation. Matthew wrote to the Jew, God’s chosen people; Mark wrote to the Romans; representing the power of world government (from Rome), Luke wrote to the Greeks; representing the cultural masses, And John wrote to the church, those adopted into God’s kingdom. Matthew was written by a Jewish tax collector, Mark was written by a Jewish companion of Peter, Luke was written by a Gentile physician, a companion of Paul, and John was written by a Jewish fisherman. Matthew concentrated on what Jesus said, His teachings (“said” ~ 151 times), Mark concentrated on what Jesus did (with Jesus’ actions most prominent), Luke concentrated on what Jesus’ felt (88 times), and John concentrated on who Jesus was (247 times). A key word in the book of Matthew is “fulfilled“ (38 times ~ concerning the Messiah of Israel), a keyword in the book of Mark is “immediately“ (42 times ~ concerning the actions of Jesus), a keyword word in the book of Luke is a “came to pass” (42 times ~ concerning the transition of God becoming man), and the key phrase in the book of John is “verily, verily” meaning: “truly,” (25 times ~ concerning how God is Truth), nothing more encapsulates the identity of God than His inability to be false or a lie, God is either righteous, just and therefore Divine; or false, sinful, and a lie which mandates that he would be a concept of man. Even the styles of each book are diverse, with Matthew utilizing elegant groupings, Mark providing simple snapshots, Luke presenting a logical narrative and John writing in a very mystical style (representing God’s mysterious Majesty). It must be kept in mind that when dealing with the subject of the diversity between the Gospels, 3 of the gospel accounts (Matthew, Mark, Luke) seem to present the last three years of Jesus life, chronologically, and in a similar order (yet not precise, with differing timelines and events) and are therefore referred to as the Synoptic (Greek syn: meaning “together” ~ or technically: displaying conditions as they exist simultaneously over a broad area) Gospels. Many writers attempt to produce a “Harmony of the Gospels,” by fitting the three Gospels together into one chronological timeline. However, doing so introduces more problems than can be answered, in that it is obvious that this was not the intent of the Holy Spirit. Because there may be two very similar events in two or more of the Gospels that vary in the details for a very good reason, they were totally different events that just appeared very similar (i.e. the feeding of the multitudes). Also, concerning the diversity between John and the other three Gospels, there is the issue of multiple events as seen in Jesus clearing of the Temple which is referred to as taking place in the first of His ministry on one account , and then at the end of this ministry at another (Matthew 21:12). Each gospel needs to stand on its own, with us understanding that the Holy Spirit might choose sometimes to omit certain details in order that other aspects of an event are made clearer in order to create a certain emphasis. Yet, in other situations the Holy Spirit might bring out other details in order to create yet another emphasis in a separate account; or they may be completely different accounts. The point is God engineered four different accounts of the last three years of Jesus life because He wanted us to have four different perspectives, diverse from each other and never to be mixed, and to twist the text so as to fit together a puzzle never met to be arranged this way is unwise at best, and un-Biblical at worst (yet there is a benefit from fitting together timelines in a loose manner in order to cross reference situations and to glean different aspects of the same event, yet this must be done very carefully and loosely; never forcing any issues or changing any events in order to have them fit together in a particular chronological order). One last consideration that needs to be addressed is that of the diversity of acceptable writing styles of the Hebrews (the Hebrews and Jews of two thousand years ago or more) as compared to modern English today. To us in America, we are very linear in the way that we think and process information. When we present events in someone’s life we start with a timeline from the left to the right, which is chronological concerning the events as they occur one after the other. According to the Western train of thought, this makes complete sense to you and me, yet, it is not the same concerning the Hebrews of thousands of years ago. To the Hebrew, the most important thing was the priority of what was being communicated, rather than the sequence of events. What they focused in on was the important issues first, with the chronology of the timeline a servant to what was more important. This doesn’t become a problem as most of the time the Old Testament follows a linear chronological order which does not do violence to the priority of what is being communicated. However, whenever we read John’s Gospel, the mysterious Gospel which presents “The Son of God,” Deity (perhaps the greatest mystery to man [“a riddle, wrapped in a mystery, inside an enigma”] and far beyond his ability to comprehend is, God; and even within this yet further more unfathomable conception is God in man in the person of Jesus Christ); we need to understand it’s presented according to the mindset of the Hebrew. The Gospel of John presents groupings of situations according to the importance of what is trying to be communicated, as opposed to any chronological logical presentation. The outline of the book of John is not chronological, but is organized around seven miracles, which lead to seven discourses, and then seven “I AM” statements; all in order to establish the profound insight that Jesus Christ is the Son of God, Divine, beyond human compare, Preeminent among all of the creation. Thank you, Chuck Missler, for so much of this information; much noted by wise men of the last few centuries commented to God and His Word. (Heb 8:2) A minister of the sanctuary, and of the true tabernacle, which the Lord pitched, and not man. (Heb 8:5) Who serve unto the example and shadow of heavenly things, as Moses was admonished of God when he was about to make the tabernacle: for, See, saith he, that thou make all things according to the pattern shewed to thee in the mount. (Heb 9:2) For there was a tabernacle made; the first, wherein was the candlestick and the table, and the shewbread; which is called the sanctuary. (Heb 9:6) Now when these things were thus ordained, the priests went always into the first tabernacle, accomplishing the service of God. (Heb 9:21) Moreover he sprinkled with blood both the tabernacle, and all the vessels of the ministry. (Heb 13:10) We have an altar, whereof they have no right to eat which serve the tabernacle. THE TEXT USED IS FROM THE: “H KAINH ΔΙΑΘΚΗ” (Greek New Testament) translation by the Trinitarian Bible Society, and is a Byzantine text in accordance with the Textus Receptus. TYPES IN HEBREW, Sir Robert Anderson, Kregel Publications, Grand Rapids, Michigan 49501, USA, 1978. Boardman Press Inc., Nashville, TN 37234, USA, 1960, Page 00. INERRANCY, Norman L. Geisler, Zondervan Publishing House, Grand Rapids, MI 49502, USA, 1980. DICTIONARY OF NEW TESTAMENT THEOLOGY, C. Brown, (vol 3), Zondervan Publishing House, Grand Rapids, MI, USA, 1978. **** Uses Alexandrian Codex ? I have been born again since 2001. I study and read, but I am also a thinker. I know we are not suppose to throw the baby out with the bath water, but once I hear a false teaching by a pastor (well known or not), I tend to never want to listen to them again because I am not sure of whether or not what they will/are teaching is accurate. The example of pretribulation. I believe in prewrath, but in depth studies that I have read and learned is that we will go through horrible tribulation otherwise why we have to endure to the end or persevere? Persevere through what? Hang nail? Someone offending us? Most pastors and people will say that it is one those things for which opinions can be different. My thought is that the Bible is His Word and cannot have opinions on interpretation. I believe ALL of the bible and think proper interpretation should be pivotal. We do not have to be legalistic, and teachers will be held to a higher account, but if they are teaching incorrectly why would I listen? It says even the elect will be deceived. Rhetorically, who are the elect? Are they teachers and elders? Are they the saved in Christ? Yes. It tells us to not be deceive, watch out that no one deceives you. If elect followers (I know some truly saved who watch him and Joyce Meyers) of Joel Olsteen are deceived…. do they go to hell thinking they were following the teachings of a godly pastor? What of the elect followers who follow the teachings of John MacArthur or John Piper etc.? You may not think the latter are able to be deceived. Could you be wrong? Why would Jesus say this? He did not say it to make us chase our tails, ie. believers can’t be deceived and if you are deceived you are not a believer etc. I have learned that Jesus was a Judahite and followed that to which the Pharisees practiced Judaism from the Torah and Talmud. He called them children of Satan. I wish to learn so much, but I do not know where to turn. Could you give me a list of the dictionaries and concordances I need to start studying the word more deeply? Please feel free to email me directly. ← What Do You Worship? ~ This Cuts Me To The Bone!